It’s the middle of the week after Christmas, the “low days,” after the children and grandchildren have come and gone, and the house no longer rings with activity. The Christmas tree looks barren, and the trash has been taken out, except for the one box our Siamese cat, Oliver, has appropriated for his own use. Miserable from too much rich food, my husband and I can’t face the leftovers one more time, so I’m making soup. Not just any soup, but a simple one my grandmother used to make, “homemade” vegetable, which involves some chopping and opening of cans and mostly a lot of waiting and stirring. Because we have a ham bone left over after Christmas and I have the long winter afternoon ahead, it seems a good time to make it. Like my grandmother, I make this soup from memory. It’s been years since I attempted it, but I do recall that the ham bone has to simmer at least three hours to generate a stock, and then I saute onions and celery, add lots of tomatoes (canned will do) and the ham stock, and let them simmer for another hour or so before I add whatever vegetables I choose: this time, it’s cream-style corn, which helps to thicken the soup; a few potatoes, chopped; some of the leftover ham, frozen peas. This is a forgiving soup; kale is also a good choice, or cabbage, if you want to make it a little healthier. But today isn’t about healthy. It’s about remembering, and tradition, and soon the house starts to smell like the house I grew up in, a house that held three generations. My grandmother was always the cook, my mother like an aging apprentice. My grandmother seldom used recipes but cooked by instinct: a handful of this, a pinch of that. 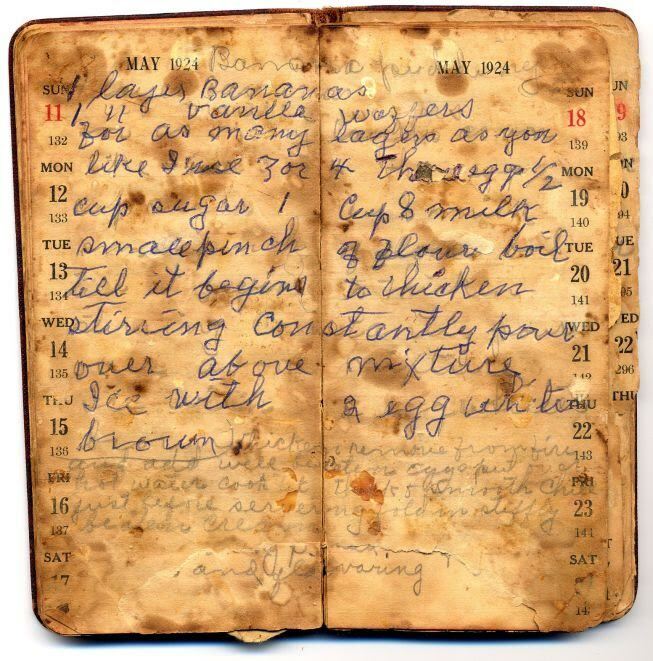 When she did use a recipe, she often made notes about how she altered it and made it her own. As I stir this soup and wait for the flavors to meld together, I remember her life: her shame at having only gone through the eighth grade. The way she nursed my invalid grandfather. The big garden she kept behind our house where she grew much of what our family ate. She was a storyteller, too; I believe I inherited my love of story from her. I remember the stories she told and how they evolved over the years, never quite the same from one telling to the next. So it is with this soup: I make it one way this time, another way the next, but I will write this recipe down so that my grandchildren, during their own “low days” in the future, can go about the simple task of throwing ingredients into a pot and nurturing them along until something delicious emerges: a simple, hearty soup for a winter evening, a soup for remembering.